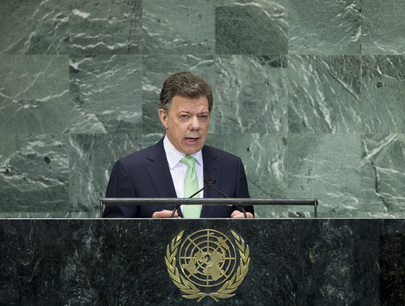 JUAN MANUEL SANTOS CALDERÓN, President of Colombia, recalled that he had spoken from this podium two years ago to express his country’s aspiration to become a Security Council member for 2011-2012. Colombia had taken on that responsibility and participated in decision-making on critical situations that threatened world peace. In doing so, Colombia had maintained independence and was mindful of the enormous commitment required to work in favour of international peace and security. It had been a particularly troubling time. Countries like Liberia, Sierra Leone and Côte d’Ivoire were making strides towards peacebuilding and the rule of law, he continued. In Libya, a relentless tyranny that had been around for more than 40 years had been broken in a process where the Security Council played a decisive role. “My Government did not hesitate to condemn the violent repression that the civilian population, justly clamouring for the exercise of their fundamental rights, was subjected to”, he said, adding there were still violent groups that wanted to sabotage a transition to democracy and use terrorist methods, such as the attack on the United States Consulate in Benghazi. On Syria, he expressed frustration that the dire situation had continued for more than a year and half and the international community had been unable to put an end to the tragedy that was taking more and more lives every day. Stressing that the application of Kofi Annan’s six-point plan would contribute to facilitating a Syrian-led political transition, he expressed support to the new Joint Special Representative of the United Nations and the League of Arab States, Lakhdar Brahimi. He also recalled that Colombia led the proposal to establish the Sustainable Development Goals, which was the most important result of the United Nations Summit on Sustainable Development, known as Rio+20, held earlier this year. The United Nations Secretary-General had identified them as one of the five priorities of his legacy. Also this year, 30 Heads of State and Government from the Western hemisphere gathered in Colombia for the Sixth Summit of the Americas, a meeting characterized by frank and open dialogue regarding the most crucial issues in that region and the world, including the issue of drug trafficking. “The debate on drugs must be frank, and without a doubt, global,” he insisted. Amid the international turbulence, Colombia had managed to maintain a healthy and growing economy that had created more than 2 million jobs over two years and that shows important progress in reducing poverty, he said. The Government had put in place initiatives of great social impact, such as the Victims Law, the only one in the world that sought to return lands to displaced peasants and some repair for the victims of an unfinished conflict, as well as Hydrocarbon and Mining Royalties reform to distribute much more fairly the revenues from these activities and generate a more effective social development.